Do you want to achieve the look of Australian landscaped gardens that are made even more beautiful by premium quality natural stones? Check out the available granite pavers suppliers in the Land Down Under. Australian suburbs are made more special by the amazing landscape designs of countless households. You would not be disappointed because homeowners invest a good lot on curb appeal. It is quite helpful that the locals are also well-supplied with quality materials that make their gardens and outdoor areas outstanding. There is a good supply of granite pavers all over the country, which adds up valuable beauty in hordes. 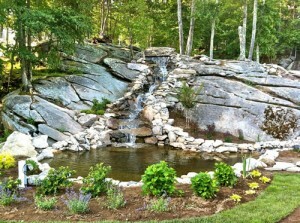 There are, however, more notes on landscape design that you must keep in mind to achieve a setup that suits our mood and style perfectly than getting a hand on stylish boulders. With choices that can be overwhelming at times, including those choices of granite pavers, you need good advice that will lead you to better decisions in the process. Draft a plan of how you want your outdoors look like. Establish both needs and wants, and learn what those to prioritize are. Do you have growing kids at home who need space that will exhaust their energies? Do you want your garden to be a bounty of organic goods by planting veggies and fruits? How much space is available for every need or want? Of course, you have to be clear about spacing because that will also determine what type of design will fit in. Sun and wind patterns have something to do on how well you will be able to grow the plants that you want to line up your garden. They also matter in terms of how you want to use this space outside of your house. If you plan a coffee table setup on a particular space in your spacious garden, make sure the area does not get too much sun exposure at least at times of day when you would like to sit down, relax, and enjoy a good cup. Lining up a granite patio in a place where it is hot round the clock is also not a good idea because it will not be as relaxing as you might have planned. Work around your garden design on a particular focal point. You must define what it is you want to highlight in your curb appeal before you call in stone exporters to deliver the goods to you.